Liz Perkins is a road cyclist and business owner in Alexandra, Central Otago. She moved to Alexandra about 12 years ago from Southland. Having spent a fair few hours in the horizontal hail and rain she was pretty motivated to move to Central for the great weather, and in her words “a whole lot less cow poo”. Why do you think Central Otago’s a great place for road cycling? I think that living in Central Otago it makes it easy for it to be lifestyle, rather than something you do on the side. 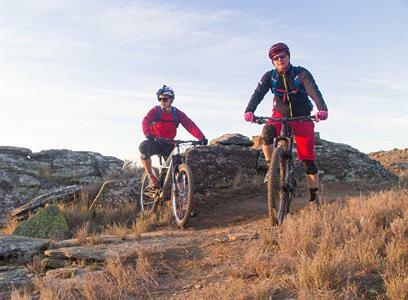 Because it’s so easy, it tends to attract similar people to live here and you end up with these great groups of really social riding experiences. Central has a great networks or bubbles of riders, we’ve produced a fair few top level cyclists. This has a filter down effect to the more ‘human’ of us. It’s a way of life for the whole community. Almost everybody rides in some way, shape or form. Our cycling community here in Central Otago is massive. You get people who ride once a month, to people who ride one to two times a day training for big events, and everywhere in between. There’s a couple of great bike shops with really invested people running them, and a few great weekly groups. How would you describe Central Otago’s road cycling to others? It’s so easy, within minutes you’re out of town, the traffic is really friendly. There are so many great places to ride that you’ve got options. You don’t need to take the same block, or the same courses, there is always a new adventure to be had. The landscape and the infrastructure is really supportive of riding. There’s a little township every 30-40km so getting a coffee, a drink or a bathroom stop is not far away. 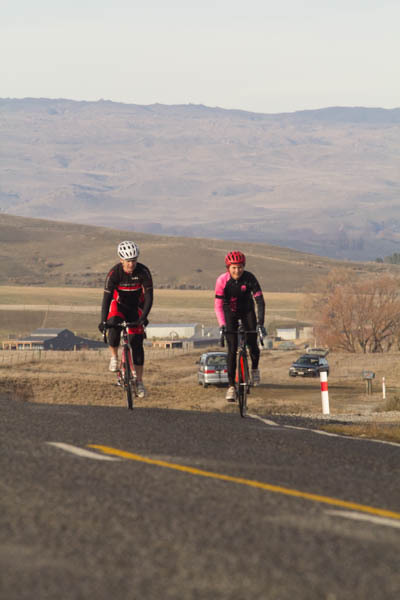 The scenery changes so often – a ride from Alexandra up through the Cromwell Gorge and up towards Wanaka has a different feeling to riding through the Maniototo, or riding towards Roxburgh for some good hill climbs. You’ve got the options – a flat ride or tough hills. Of course you can’t help but admire the scenery as you’re riding. I get picked on a bit sometimes for staring at the scenery instead of riding hard. What are you favourite local road rides? One of my favourite rides around Alexandra is our weekly women’s riding group we call the ‘cider riders’ because that’s how we like to finish the ride. We normally do about 30kms which is accessible for most people. It’s a mixed group from new riders to people training for ironman events. I understand that due to the amount of talking we can be heard from a kilometre down the road. It always ends up back at Monteiths, and in summer that might go on to 9 or 10pm at night in the heat. Where would you normally ride? We have a neat wee ride here in Alexandra called ‘the block’ that starts here in town and heads up Letts Gully Road, which in the winter can be pretty cold, but in summer it’s a nice reprieve from the heat. At the top you’ve got this really wicked view looking out towards Leaning Rock and the MacArthur Ridge Vineyard. You ride along Springvale Road, and then come down ‘Brandy Hill’, which is really fast and a little bit curvy. Then you’re riding along the straight with a slight downhill, past an old fence and then into the township of Clyde, which gives you a chance to have a quick natter at the give way signs. Then the loops goes over the Clyde Bridge and up the short sharp uphill onto Earnscleugh Road – that gets you puffing. Then Earnscleugh Road has just amazing views, looking up to the Old Man and Old Woman Ranges, and you quite often get a short tail wind. There’s a few little side roads that you can do to add a few extra kilometres, and these go past vineyards and orchards, which lets you get in amongst what’s happening in the season. Later in the season you can smell the fruit, and see the colours change and people working. I guess at times it feels like you could be in Europe. It’s just fantastic. Why do you enjoy road cycling here in Central Otago? Riding in Central Otago ticks so many boxes for me, because it allows you to connect with other people in the community that you might not connect with normally. It helps builds your social network. My business is a social business, but you don’t connect in the same way as you do when you’re involved in sport. The great thing with cycling is that there is no fixed time commitment, you can ride with anybody and it makes for a really diverse group. Through cycling I’ve got some of my closest friends, where we have that connection of having shared experiences, the conversations, even the hurt after a particularly hard ride. Liz’s recommendations for three great local Central Otago road rides. 1. Letts Gully Block - the block around Letts Gully, down Springvale and back along Earnscleugh Road. It’s only 30km and you can do a couple laps if you’re feeling keen. 2. Around Lake Dunstan - There’s a beautiful ride in Cromwell going up Lake Dunstan toward Tarras, around the back to Luggate, and then back to Cromwell. It’s about 90km great if you’re training for an ironman it’s a great loop. It has so many different environments, you never get bored. 3. Alexandra to St Bathans - Riding out in the Maniototo, the roads are long and straight. There’s good little hills, and the communities are so friendly. You can do 100-120km loop from Alexandra right out to St Bathans, some of the scenery changes so quickly you’ll get 3-4 different landscapes. When you get to St Bathans, go to the pub – get some carrot cake and a really good coffee. Then it’s just a cruisy 60km mostly downhill ride home. If someone was visiting Central Otago how do they get involved in a road ride? The Alexandra Cider Riders meet Tuesday or Thursday at 6pm at the Alexandra i-SITE (which is conveniently opposite Monteiths Alexandra). 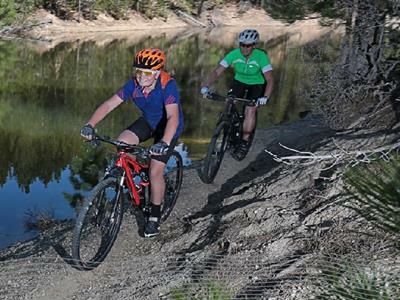 The Central Otago and Wakatipu Cycling club also organise a range of events throughout the season see their event calendar here.